POMPAC is POMA’s Political Action Committee (PAC) which receives contributions from DOs and in turn, uses those donations to support state legislative candidates who are supportive of DOs and the care they provide. POMPAC can be viewed as the political arm of POMA. It is illegal to use POMA funds to make donations to the PAC. As a result, contributions must come from individual POMA members who recognize the value in supporting POMPAC because it will enhance POMA’s advocacy efforts. POMPAC has scheduled a fundraising reception in honor of State Representative Kerry Benninghoff (R-Centre) House Republican Whip. The reception will be held on Thursday, May 2 from 6:15-7:15 at the Annual Clinical Assembly with a donation set at $150. Rep. Benninghoff has been a supporter of POMA’s advocacy issues for many years. The Pennsylvania Senate Committee on Consumer Protection and Professional Licensure approved Senate Bill 25 with two no votes. 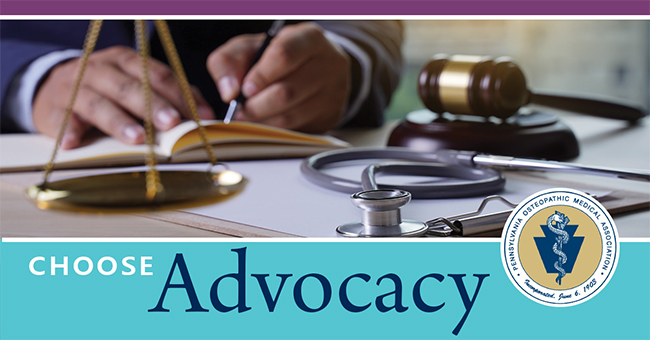 SB 25 provides CRNPs with independent practice by removing the collaborative agreement requirement with a physician when a CRNP is making acts of medical diagnosis and prescribing. This week, Pennsylvania Auditor General Eugene DePasquale testified in a legislative hearing of the House Health Committee about his report, “Bringing Transparency & Accountability to Drug Pricing.” Auditor General DePasquale’s report shows how Pharmaceutical Benefit Managers (PBMs) - or middle men - impact the costs of prescription drugs, and in many cases, PBMs are making the cost of prescriptions higher. Act 96 of 2018 requires electronic prescriptions for scheduled drugs II-V. The public policy intent is a very good one, which is to mitigate scheduled prescriptions falling into the wrong hands. It is likely that many POMA members already use e-scripts for their scheduled drug prescriptions. In these cases, Act 96 merely codifies in the law what you are already doing. However, what if you are a small independent POMA member? This was the exact concern expressed by a POMA member at last month’s meeting of the State Board of Osteopathic Medicine when it reviewed the Act. POMA members stepped up and made their voices heard on the proposed change in the Supreme Court’s venue rule change. POMA’s action alert asked you to answer the call and you did! Thanks to everyone who took the time to send comments opposing the venue rule change to the Supreme Court’s Committee on Rules of Civil Procedure. POMA sent its official comments to the Court as well.